The department was founded by Doctor of sciences, professor A.I. Kondalev in 1963, who was at the head till 1989. There are 18 scientists in the department now including 4 Doctors of sciences, and 4 PhDs. Head of department, Doctor of technical sciences, Professor. 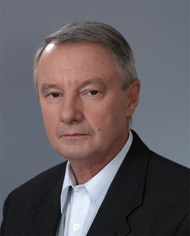 He was awarded Academician Lebedev Prize, Honorary degree Inventor of the Year of Ukraine, awarded State Prize of Ukraine in Science and Technique, and Honorary degree Honoured Scientist of Ukraine. theory and methodology of processing results of multiple measurement conversations of physical quantity, theory of redundant measurements, and metrological reliability of means of redundant measurements. it was developed theory of redundant measurements, and methods of creation of measurement means on this base. georadar control system with smart sensors, and first stage of automation information-measuring system "Prikarpattja" for measuring surface water parameters, and remote system for groundwater, and environment parameters control in "Zmeinyy" island. compute device "Yakist" for estimating quality of consumer electric energy. All products, designed in the department, are new, patented and awarded diplomas of international and national exhibitions, awarded as the best inventions of the year in Ukraine. It was registered new information technology "Information technology for express-diagnostics of plant state in large territories under stressful factors". It was developed National standards in microprocessor technique and biometrics areas. Within the scope of association agreements, grants, and international projects the department efficiently cooperates with the universities and organizations of Bulgaria, Germany, Poland, Malaysia, Egypt, and USA. © Data-Acquisition System Department, 2009-2019. All Rights Reserved.